Santali is a language in the Munda subfamily of Austroasiatic, related to Ho andMundari. It is spoken by around 6.2 million people in India, Bangladesh, Bhutan andNepal, although most of its speakers live in India, in the states of Jharkhand,Assam, Bihar, Odisha, Tripura, and West Bengal. The language has its own script, known as Ol Chiki and a variant of the Latin alphabet is used, too. 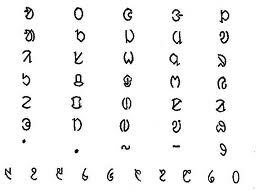 Pandit Raghunath Murmu ( May 5, 1905, Dandbose, Odisha State, India – February 1, 1982) was the creator of the writing known variously as Ol Chiki script, Ol Cemet' ("language of writing"), Ol Ciki, Ol, and sometimes as the Santali alphabet, in 1925, used for writing the Santali language of India and neighbouring countries. 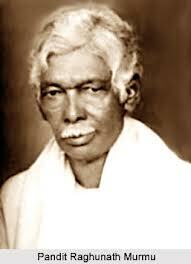 He was also a spiritual Guru for Santhals.He wrote "Sarna Dhorom Hitlay ar bang HITAL".He preached "Sarna Dhorom". He also worked a lot for safeguarding tribal interests in Jharkhand. He was born in a village, called (Dahardih) Dandbose, on 5 May 1905 in theMayurbhanj district of Odisha, then part of British India. He was a school teacher at [Badam Talia) near Rairangpur, in Odisha .